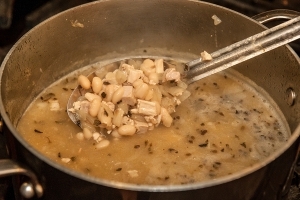 Combine beans, broth, garlic powder and the onions in kettle or large stock pot. Combine cumin, oregano, cayenne pepper and chicken. Mix well and add to beans. Using a whisk, add the cornstarch mixture to the bean mixture. Simmer the chili until thickened. Pour into serving pans. Serve immediately or cover and place in the warmer until ready for service. CCP: Hold and maintain product at a minimum temperature of 135 degrees F. Check temperature every 30 minutes. Portion 1 cup of soup in bowls topped with ½ ounce of grated cheese per serving. Each portion provides 1½ oz. eq. of meat/meat alternate and ½ cup ofbeans/peas vegetable. 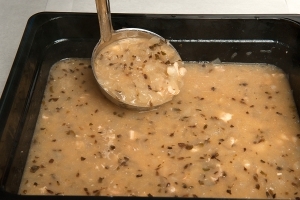 Portion 1 cup of soup.